Ask fellow campers about "Schroeder Park" and nearby attractions. Great location on the Rogue River, launch and fishing access, good accessible FHU, asphalt for 5er, picnic table and outside area dirt, full shade, easy reservations through county parks director. Camp hosts were very dedicated to " their" park, worked hard to be sure trash was dumped area was clean and secure. Nice dog park in adjacent park and all the blackberries one could ever eat. Stayed for 10 days. We camped at Schroeder Park in a Fifth Wheel. We stayed just for a weekend to have full hookups and dump our tanks. The park is right along the Rogue River and there is a boat launch available. The sites are not on the river, but it is an easy walk to the river. The staff were doing a great job while we were there keeping the sites free of leaves (a continuous task!). There are a few places where the road is very unlevel due to tree roots (think speed-bump made by roots). We particularly appreciated the friendliness and help of the staff at the park. We camped at Schroeder Park in a Motorhome. Yumberry Bowl in the Safeway shopping center for fruity deliciousness! County park located near the city of Grants Pass - on the Rogue River. Kids loved the proximity of the river - floated on tubes. Last year it seemed alot of homeless were using the restrooms-this year they added locks with a combination. Full hook-ups so a great value at $32.00 per nite. We camped at Schroeder Park in a Travel Trailer. A must do while in the area are the Jet Boats in Grants Pass - I never miss an opportunity to do this when I am in the area - so much FUN! Just left the park after a four night stay in the yurt. The hosts were so pleasant and friendly. I have stayed many times and they were the best hosts we have ever dealt with. The roads could use some work, but it is a clean and well kept park. We camped at Schroeder Park in a Cabin. Schroeder Park is beautiful with wonderful camp hosts and a Ranger who all work hard at their positions. 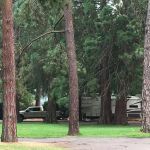 The RV sites are asphalt and grass and mostly separated by large privacy shrubs. The trees in this lush, green park are aged and lovely. Adjacent to Schroeder is a very nice dog park. Solid 50 amp and water pressure at our RV site. The issue: homeless defecating in the park and on the back hill behind our RV site. People living in tents with pit bulls and blaring TV's are not what I pay $30 a night for. This is not a park where you feel safe or an area where you should walk at night nor leave anything in your car. We had several items stolen and the dog and human feces really did us in. We regret that we will never return nor can we honestly suggest anyone do the same. I so wish someone would had posted these facts before we made an on line reservation for 10 days. It's really a shame as the staff is sincere and the park itself is very nice. We camped at Schroeder Park in a Fifth Wheel. Bring an Oregon CWP and a fly rod for the upper Rouge. A great little park if you want to stay close in to the city of Grants Pass but don't want the commercial type park. Right next to the Rogue River, quiet and well kept. The driveways have become buckled somewhat by the large trees but not a huge issue. Camp host was very friendly. If you are looking for seclusion near the city, this is a good bet. We camped at Schroeder Park in a Fifth Wheel. Check out the Grants pass pharmacy in old downtown and their ice cream fountain which has been open since the 1930's. This is a Park in decline. Josephine County doesn't provide financial support so the camping fees are all the funding available for upkeep, maintenance and repairs. Camp host is friendly and helpful, also hopeful. We usually select a pull-thru full hookup site but this time ALL the pull-thru sites were occupied by tent campers, that we didn't understand. The six sites available to RV's were back-in with full hook-ups, next to the upper part of the park and fence. The fee was raised $8 from our last stay here in 2014 and nothing has changed for the better. The website should show which sites are available on a day to day basis. The utilities all worked okay in the RV sites. Wi-Fi was iffy, HDTV brought 4 stations not worth watching. Restrooms and showers were being kept clean by the host couple. The propane source on Redwoods Highway was selling for $1.60 gallon this year. We feel the nightly fee, for what is offered here, is way too much. Next year we will find another RV park in Grants Pass. We camped at Schroeder Park in a Fifth Wheel. If you have a fifthwheel in the 38' + range and a longbed pickup, you might have some problems maneuvering in this park. Way too many trees in the RV area. Narrow loop road with many rough spots from tree roots. Decent water pressure. Lost power one day for a short time. Dog park is adjacent in a separate park. Easier to just walk the dog on a leash. No wifi at $30 a night??? What?? For such basic amenities, it is overpriced, IMO. We camped at Schroeder Park in a Fifth Wheel. Drive through sites are closed for the winter so there are only 7 sites open for camping. The sewer system empties into the city system and there are restrictions posted at the kiosk. The camp host was helpful and friendly. This campground is on the Rogue River with boat launch. The park has yurts for camping. There is parking for the park play area and a turn around for RV's to use when leaving the park. This is a peaceful place to rest and its fairly close to services and amenities. One dealer on the Redwoods Highway is selling propane at $2.09. We enjoy this park and stay here whenever we are in the area with the RV. We camped at Schroeder Park in a Fifth Wheel. In season there is Rogue River rafting, trails for bicycle riding. You will find some excellent wineries in and around Grants Pass. Wild River Pizza and Brewery is a must visit...best pizza anywhere and a variety of very good brews. There a two good public golf courses near Grants Pass. This is the midway point in an otherwise long drive south and makes a good place to stop and rest and relax for a while. This is a nice county campground. The park is well maintained and the hosts, who live on site, are friendly and helpful. Sites are nicely spaced and surrounded by grass and trees. You do feel like you are camping in a park. The Rogue River is a short walk from the campground and there is a boat launch. It's convenient to Grants Pass and I-5 without being too close. The bathrooms could use updating but they are clean. We would stay here again. We camped at Schroeder Park in a Truck Camper. This CG is close to amenities, quiet, and on the Rogue River with boat launch. Great playground and picnic areas. Sites are paved with full hookups including 50AMP. There are rental Yurts. The camp host is very helpful and the park is well cared for. Dated though the CG may be, the restrooms and showers are clean. This is our third visit here, and we met friends here for a quiet and restful week. More than a dozen local HDTV stations and good Wi-Fi signal. We will definitely return when we pass through the area in the future. We camped at Schroeder Park in a Fifth Wheel. Nice family county park. We were in #5, a pull-through with full hookups. Our site was up on a little hill with the view of a nice grass area with a volley ball court. No one close to us all around. We could see the Hell-gate jet boats go by on the Rogue River also. The jet boats are a fun thing to do as it is only a few miles away. Be prepared to get wet. There are a lot of shade trees, so no roof-top satellite TV signal. But we were able to get a few over the air HD channels. As in most parks, dogs are to be on a leash. Except if you’re a little yippy dog that runs up to other dogs on leashes and has a very high pitched bark. Oh well, we will be back. Park host was very nice and helpful. We camped at Schroeder Park in a Motorhome. Small city park just outside Grants Pass. Very narrow road through the park and spaces are very tight. In June, it was very rough looking. Not much grass between spots and mostly weeds and dirt. Picnic tables are old. There are grassy areas around the park but not next to RV spots. Curved spots were a bit tricky to get out of when we left. River access is down the road. Doubt I would stay here again. We camped at Schroeder Park in a Travel Trailer. Camp host was very helpful. Walked over to the site I requested and made sure we could get setup. Full hook-ups, 50AMP,on the air HDTV drew 21 stations, good cell phone and Wi-Fi connectivity. The CG is well maintained, clean and quiet, on the Rogue River with boat launch. Roads and sites are asphalt, a little narrow but easy enough to navigate, plenty of trees but enough sun. Speed bumps effectively exist. In some places the road needs root repair. The park is dated but clean and pleasant, automatic sprinkler system during the day. There are rental yurts. Grants Pass has all the services needed, Costco in Medford. Easy access through a residential area from OR-199. We enjoyed our stop here and will return. We camped at Schroeder Park in a Fifth Wheel. 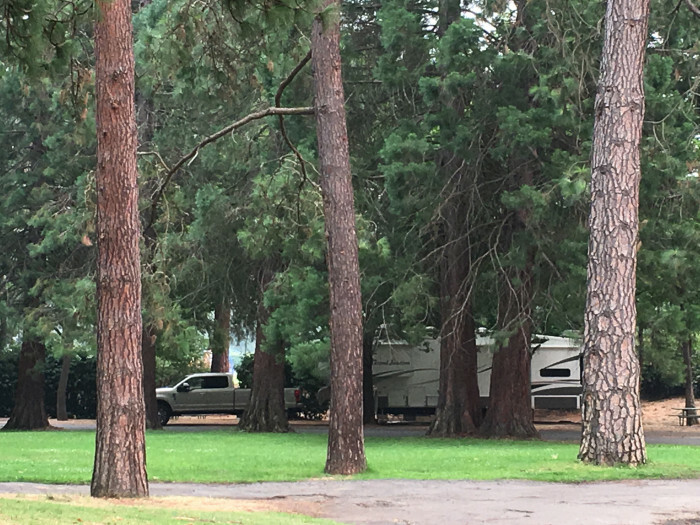 We and another couple made reservations a couple of months in advance to stay at Josephine Schroeder County Park requesting sites to accommodate 36' motorhomes. When we pulled in after 7 hours on the road we were told our RV's were probably too big for the reserved sites and that there were no other sites. We went ahead and were able to easily park. The other couple's electric went out and they had to use another site's electric even though we had informed the host. None of the other sites were ever used and on the day BEFORE we were to leave, we found out a group that annually stays here was coming in. Some of the group came a day early and informed us - and guess what? That electric was fixed the morning we left! We've never felt less welcome. Certainly won't return unless they get a new host! We camped at Schroeder Park in a Motorhome. In season there is Rogue River rafting, trails for bicycle riding. You will find some excellent wineries in and around Grants Pass. Wild River Pizza and Brewery is a must visit...best pizza anywhere and a variety of very good brews. There a two good public golf courses near Grants Pass. This is the midway point in an otherwise long drive south and makes a good place to stop and rest and relax for a while. Are you affiliated with Schroeder Park ?